Jerky treats, a new ball, and more goodies? 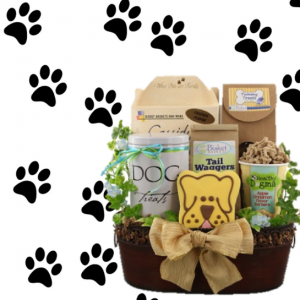 Get their canine senses tingling with the Man’s Best Friend Dog Gift Basket. This beautifully ornate basket is packed with delicious doggie treats that are sure to keep your dog’s tail wagging for months. 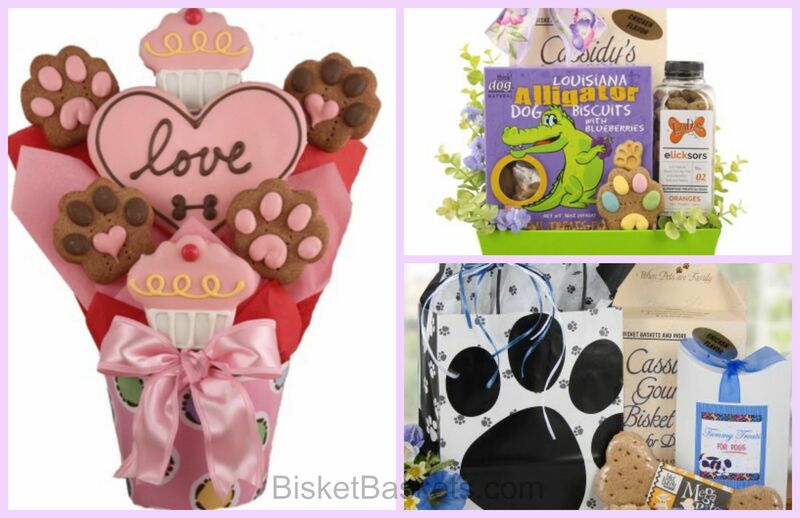 Bakery fresh biscuits together with the ornate basket make this a beautiful gift for your favorite dog. The best way to spoil your kitty is getting them all the treats and catnip toys they want. 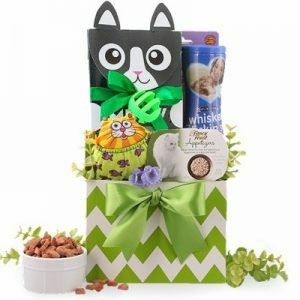 Cats are always looking for something new and exciting to dig their paws into and the Cat Fish Cat Gift Basket is overflowing with plenty of goodies. 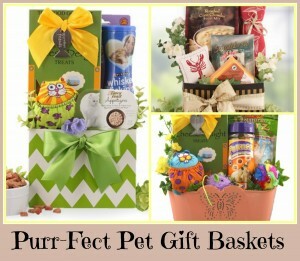 You can also create custom pet gift baskets to keep your cat purring through every special occasion. Finally, treat the whole household and your furry friend to a night of pizza with the Pizza Pals Dog & Owner Gift Basket. This special gift basket delivers everything you need to make a delicious gourmet pizza and also includes a yummy treat for the family dog. The embossed oval tin can also be used as a storage place for all of your dog’s toys. Bisket Baskets offers a range of gift baskets, bouquets, and other beautifully wrapped gifts for all occasions. Check out the rest of our pet gift baskets for dogs, cats, and pet lovers on our online store. August the real Dog Days of Summer! Summers are always warm but the month of August really heats up and is very well known as the Dog Days of Summer and this year we’ve designed a dog gift that is truly one hot gift! Our DOG DAZE DOG GIFT BASKET if filled with delicious doggie loving treats… BISCUITS! All dogs love biscuits so we designed this assortment of treats inside a yellow sunny and fun polka dot tin container that can be reused for years to come. You can celebrate pawesome times like thanking friends and family for putting you and your pup up at the beach house for vacation or to thank the neighbor and his pup for mowing your lawn last week or heck even a pick-me-up for that older pooch that thinks it’s just too hot to leave the porch! Have fun this summer and remember BISKET BASKETS for all your appreciation, get well an any other gifting needs; we’ve have gifts for your FRIENDS AND FAMILY, your favorite KITTIES AND POOCHES and yes, even those at work with our CORPORATE line as well. During the holidays, many families tend to introduce a new, four-legged family member. 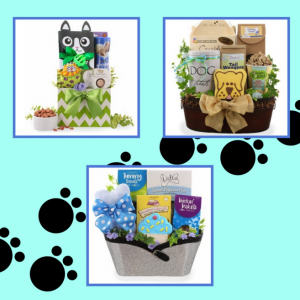 Celebrate the latest addition with one of our pet gift baskets! Each of our baskets has plenty of items to make the new pet feel comfortable while helping out the new paw-rents. The majority of our baskets include treats that your dog or cat will go crazy for. From hand iced gourmet dog cookies to gourmet bites, your pet will look forward to hearing that bag or box open. Also, some baskets have kits with ingredients to make your own treats for your furry friend. Can you have a pet gift basket without toys? Of course not! Our baskets have fun, engaging toys that any animal will find irresistible. Playtime is made even better with a chew toy, tennis ball, or a plush toy! Finally, the majority of our baskets are made in a reusable container. These containers are perfect for storing gear like leashes, extra collars, or bandanas. They’re also good for storing cat toys or as a place for your cat to curl up in. Because lets be real, cats sometimes are more interested in the packaging rather than the gift itself! 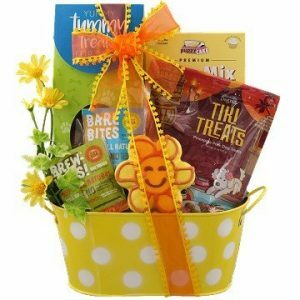 To see all of our pet gift baskets and to order one for the newest pet in your life, visit us today at BisketBaskets.com! You’ll find plenty of pet gifts for any occasion that will surprise both owners and pets alike. Start spring with a bunch of new treats! This Classy Canine Dog Gift Basket has a variety of treats to keep your pup full all season. Choose from a hand iced dog cookie, biscuit mix, and plenty of other fresh treats. You’ll also get a decorative basket and canister to store all of your goodies! For the feline in your life, the Cat Fish Cat Gift Basket has plenty of treats and toys for them to choose from. Don’t let your dog get all of the fun treats this season! Spoil them with this basket of cat nip toys, cheese treats, and tuna appetizers. Have a pup that has a spring birthday? Then celebrate in style with the Party Animal Dog Gift Basket! Give them a variety of bakery fresh biscuits and a special toy to show them how much you love them. Then store all of their birthday gifts in this decorative basket for easy access. There are plenty of reasons to celebrate spring with your pet! Send a four legged friend you love one of our cat or dog gift baskets so they have fun things to enjoy this spring. 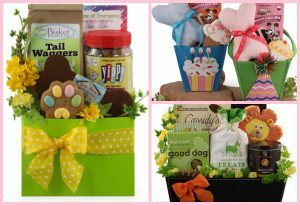 Have a happy spring and check out all of our pet gifts today at BisketBaskets.com. Don’t forget your Dog this Halloween! We include our pets in most holidays, so why should Halloween be any different! Make sure your pup has some treats they can eat with a dog gift basket! Loaded with treats, toys, and other goodies they are sure to do some tricks for these treats! Have a dog who loves different treats? The Halloween Dog Pound Basket is sure to please. With an assortment of fresh baked treats and even a puppy “beer”, they will go crazy this assortment of goodies. For pups who are celebrating their first Halloween, this Halloween Dog Gift is perfect. Loaded with unique treats, including a mummy dog bone, puptato chips, and biscuits, this dog gift basket has an assortment of Halloween goodies. Does your four-legged friend go trick or treating with you and the family? Then bring some treats along for them to enjoy. The Pup Prowl Halloween box is packed full of chicken treats they’ll love. It comes in a festive container that will go with any costume! 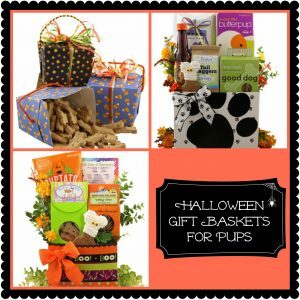 There are plenty of other treats for your dog this Halloween, so be sure to check out all of Bisket Basket’s dog gift baskets. We have gifts for your dog or cat fit for any occasion. Your pets will thank you for the treats! Bringing a new dog into your home is an exciting time for you in your family. So celebrate this new addition with some treats! 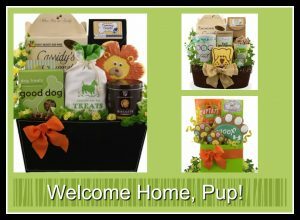 Whether you are the new dog owner or know someone who is, consider dog gift baskets to be the best solution to give your new pal. Leader of the Pack – Not sure what your new puppy likes for treats? Then get a variety for them to try! This basket has a number of delicious biscuits and dog cookies that they are sure to love. When they’re done with the treats, use the decorative basket to hold all of their new toys. Classy Canine Dog Basket – We all know our dog s hould be spoiled, and this basket will help you do so. Filled with an assortment of treats, these are perfect for rewarding good behavior and training new ones. Run out? No problem! Included in this basket is a box of biscuit mix and a cookie cutter so you can make your own. Just BePaws Dog Gift– Have a pup with a diverse taste? Then this cute little basket is just for them. This bright basket comes with puptato chips and sweet potato treats for a quick snack before dinner. After, reward a long walk couple of iced cookies. With a biscuit and icing that is specially formulated for dogs, they’re sure to develop a sweet tooth! Still not sure what to get your four-legged friend? Then check out BisketBasket.com’s wide collection of dog gift baskets for the perfect fit. Celebrate Your Pup’s Birthday with a Dog Gift Basket! When celebrating your dog’s birthday, it is sometimes hard to choose a gift. Sure, they might have a special treat or a favorite toy, but finding them something different can be difficult. Save yourself the time of finding a great gift and spend more time with the birthday pup. Here are a few gift options to help you celebrate. Is your dog happiest when spending time with its favorite human? Then go with our Dog Birthday Pet-zzazz Gift. Treat them with special biscuits and a squeak toy. Don’t forget the birthday cake! Each one of these gifts comes with a box of puppy cake mix. It even has dog-friendly icing! Looking for that perfect first birthday gift for your puppy? Including two types of treats and two gourmet dog biscuits, your puppy is sure to have a delicious time with our Happy Tails Dog Gift. Also included is an “in case of emergency label”, which is perfect for new dog owners. What about the dog who loves treats? The Leader of the Pack Dog Gift Basket is sure to keep them satisfied! Packed with cheese, chicken, and duck flavored treats, your dog is sure to love snack time. This basket even comes with a tin of biscuits, all natural treats, and even a special iced treat. Even if you run out of these, you’re covered with a box of biscuit mix and a bone shaped cookie cutter. Dog gift baskets are the perfect way to get your furry friend an enjoyable and different gift. For more basket options, visit BisketBaskets.com. You’re sure to find the perfect present for any dog, cat, or furry-friend loving human! Whether it is a message from a loved one or something yummy, college students love getting mail. While all care packages are appreciated, surprising your student with something different brightens their day and makes them the envy of the mailroom. Cookie bouquets are a great way to say hello and send a well-deserved treat! You can’t go wrong with a classic cookie! Our Oreo Cookie Bouquet is a great way to send a favorite snack in a fun way. With a couple different types of Oreo, each in individual packaging, your student can enjoy in their room, on the go, or share with a friend. Think your student misses their pet? 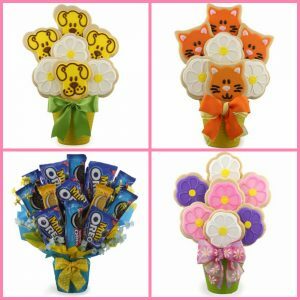 Then send them a long update on their furry friend with our Kitty Love Cookie Bouquet. Each royal icing cookie is made fresh, ensuring that each bite is equally delicious. Not a cat person? No problem! Our Puppy Love Cookie Bouquet is sure to please. Need to say “Happy Birthday” or “Good luck” in addition to saying hello? Try this Blooms Cookie Bouquet! These hand iced cookies are sure to put a smile on their face. Each cookie is individually wrapped, so they can show them off and enjoy whenever they want. Sending your college student mail doesn’t have to be boring. Sending a cookie bouquet is a unique and interesting way to keep in touch. For these options and plenty of other impressive care packages, visit us at BisketBaskets.com! Puppies Need Love too – Give them a Dog Gift Basket! Show Fido you care with a Dog Gift Basket from us! your language. With the exception of the words “walk” and “treat”, how do you really get through to your pup to let them know you care? You can always give them a dog gift basket! Here are few from our collection that we know Fido would sit AND roll over for! Pawfect Love Dog Biscuit Bouquet – There’s nothing quite like the unconditional love and affection you get from your pooch. Give it right back to them with this adorable display of dog-friend, frosted treats and they’ll be sure to know your love. Gator Tracks Dog Gift – Is your fluffy friend graduating from Puppy Kindergarten? Maybe it’s their first birthday and you want to celebrate. Whatever the occasion may be, our Gator Tracks Dog Gift is perfect gift to let them sink their teeth into. The Doggy Bag – Something simple but thoughtful, our adorable “Doggy Bag” gift is just that – a bag filled to the brim with treats for your doggy! Complete with a variety of different gourmet dog treats and other fun goodies for your pet, they’re sure to know that you love them when they get to rip into this dog gift basket! Want to see the rest of our dog gift baskets? Visit us today at BisketBaskets.com!